That's right, we're offering a massive FORTY-SIX Steam games for just a Dollar in our biggest bundle ever! All individual Steam keys, enjoy everything from sci-fi space runners and immersive RPG to flesh-eating zombies and turbo-charged pugs in the bargain of the century! 1 tier, 46 games total for $1! Bundle ends in 14 days! 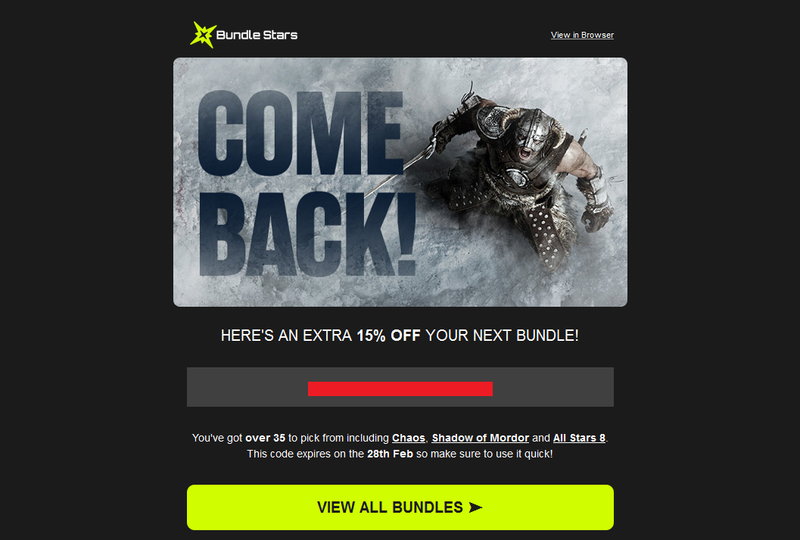 Also; remember to use your 15% voucher if you have received one by Bundle Star's newsletter! This code expires on the 28th Feb so make sure to use it quick! Simply apply it to your cart and spend over $2 / £2 / €2 to get your discount. The code can only be used once and works for the account this was sent to. It can only be used on bundles but excludes our Pick & Mix Bundles and packs. You cannot create giveaways for the following game: "Freebie"
Thanks to DerFreiherr, Mohsin & Aresda for notifying me! 46 games for $1?!?!? Hell yeah!!!! No! My precious dollar though!! Noooooooooooooooooooooooooooooom! Cards = $$ ! No chart yet, but I'm pretty sure that I own atleast 90% of those games. Hmm. hmm i got several games from the list for free, maybe it wasnt mass giveaways... then they dont apear on the freebee list right? Hmm.. Could be small quantity then, or perhaps friends gave you the games, or you bought them from bundles? Aww thanks a lot! <3 I appreciate it ^_^ And I'm glad they are useful to you! I'm shocked!!! Who is the culprit?! Also CV farming bundle if one didn't send too much of those games already. Looking forward to the chart :P This might be good train filler material, depending on how many free games there are in there. Thanks! And wow, that's really surprisingly good, all things considered. CV is pretty normal for a tier 1, so it'd be more about upping sent count than CV farming. As far as basic generosity goes, nearly all of those games are pretty dubious, so I'm not sure how much of a favor it'd be to put them up with that intent. I'm not really worried about CV :P They would mainly be used for padding if I make another Fighting Fantasy-style train or something along that line. Thanks for the info lady MilleW. I would buy it only if I have Paypal or Credit Card..
Freebie is freebie sure :D but isnt tera and turbo pug free too? 46 games, 42 owned, 0 partially owned, 4 not owned, 0 non-steam. Give in to the dark side, you know you want to. Same here... LOL! Tempted as well.. Sigh! But it also means more work ... activating keys... idling for the cards.. Then selling or sending to main account if one wants to craft the cards.. zzz.. But.. Profits? Sorry, but what 15% coupon is it? Is it given when purchasing something from Bundle Star? The 15% voucher is one some of us received by mail ~4 days ago. So if you didn't receive an email named "Your bundle voucher is inside" you are out of luck. Seems like that could be it! I didn't buy a bundle from them since 2nd December, so yeah! Nope. No. Na-ah. Nyet. No way. Not buying it. Don't even need a chart to see that my alt already has most of them and one dollar for the pack feels like daylight robbery anyway. Not even my Milleitis Buyeverybundleoma is severe enough to make me do it. I don't even remember what was the user name or fake email address I used to set up the third account. Definitely getting this. only have 11 already. Missing quite a few and actually interested in a couple so, yes please! I have everything already, so $1 saved I guess. And that's without the 15% discount. How to get 15% disc? There's a few of okay games but... eh... I'm gonna keep my dollar.